A 67-year-old man with a history of oral lesions for at least 1 year presented for evaluation. He complained of “white” lesions, primarily on his buccal mucosa, that were symptomatic; i.e., he experienced burning sensations at rest and during mastication. He denied taking any new medications, eating new foods or using new oral hygiene products at the time of symptom onset. His past medical history was significant for hypertension, mixed hyperlipidemia, type 2 diabetes and spinal stenosis. His past surgical history was unremarkable. Current medications included ASA, esomeprazole, irbesartan, metformin, pravastatin and tadalafil. He reported no known drug or food allergies, and family/social history was non-contributory. A review of systems was unremarkable, and clinical examination revealed a well-nourished, well-developed man in no apparent distress. Facial and extraoral skin was unremarkable. Intraoral examination revealed diffuse areas of Wickham striae with erythema on the buccal mucosa and generalized erythema of the posterior maxillary gingiva bilaterally. Clinical diagnosis was consistent with oral lichen planus (OLP) and an incisional biopsy of the left buccal mucosa demonstrated histopathology consistent with OLP. The patient was prescribed topical corticosteroid and prophylactic antifungal rinses and his condition improved significantly. The patient presented regularly for routine evaluation, and 1 year after his initial diagnosis, he developed a 0.5-cm asymptomatic papillary lesion on the right lateral surface of the tongue within an OLP focal area (Fig. 1). An excisional biopsy of the lesion was completed and histopathologic analysis revealed hyperkeratotic, papillary, acanthotic squamous epithelium containing a diffuse proliferation of foamy histiocytes subjacent to the basement epithelial cells and between rete pegs (Figs. 2, 3). Figure 1: A 0.5-cm papillary lesion on the right lateral surface of the tongue surrounded by Wickham striae associated with oral lichen planus. Figure 2: Papillary, acanthotic stratified squamous epithelium with surface clefts that contain orange-pink-stained parakeratin (arrows). The rete pegs are uniformly elongated. (Hematoxylin and eosin, magnification 4×). Figure 3: Foamy macrophages found between the rete pegs and primarily within the connective tissue papillae. (Hematoxylin and eosin, magnification 20×). The differential diagnosis of the tongue lesion consisted of traumatic fibroma, verruciform xanthoma and several lesions associated with human papillomavirus (HPV), including squamous papilloma, focal epithelial hyperplasia, verruca vulgaris, condyloma acuminatum and verrucous carcinoma. Focal epithelial hyperplasia (FEH) — FEH (Heck disease) most commonly affects the labial/buccal mucosa and tongue and is associated with HPV types 1, 6, 13 and 32.3,5 Clinically, these lesions often present as multiple, soft, flat or convex papules that are slightly paler than the surrounding mucosa and are asymptomatic.5 The most prominent histologic feature of FEH is acanthosis, with wide rete ridges that may be confluent or club-shaped.5 In addition, koilocytes are consistently observed in the superficial layers of the epithelium of these lesions.3 The lesions often resolve spontaneously, but may be prolonged; therefore, excision may be clinically indicated.5 This diagnosis was unlikely in the case presented, but should be included in a discussion of oral HPV-associated lesions. Verruca vulgaris (VV) — VV (common skin wart) most commonly presents intraorally on the palate or keratinized gingival tissue.1 VV has been associated with several HPV types, including types 1, 2, 4, 6, 7, 11, 16, 40 and 57.1,3,5 Clinically, VV appears as firm, sessile exophytic lesions with a white appearance.3 Histopathologic analysis of VV reveals epithelial projections with pronounced hyperparakeratotic tips accompanied by hyperorthokeratosis on the sides of the upward projections.1 Dilatation of capillaries often occurs, and a chronic inflammatory cell infiltrate may be present in the supporting connective tissue.5 The treatment of choice for VV is surgical excision. Condyloma acuminatum (CA) — CA, which is extremely rare in the oral cavity, is characteristically observed in the anogenital region.1,3 Oral CA lesions are most commonly described as multiple, small pink-white nodules that often converge to form soft sessile lesions. They are often seen on the gingival mucosa, lips and labial commissures, when present.1,3 CA can be associated with several HPV types, including 2, 6, 11, 16, 18, 31, 33 and 35, and it is more commonly seen in patients with HIV.1,5 The histopathology of CA is similar to SP, but HPV-related viral changes are always seen (i.e., koilocytes are present in the superficial layers of the epithelium).1,5 Surgical excision is the recommended treatment for CA lesions. 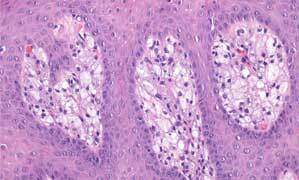 In the case described above, the clinical and histopathologic findings are most consistent with VX. The biopsy was curative for our patient, and no recurrence of the VX lesion has been observed. The patient’s OLP continues to be managed effectively with topical corticosteroid and prophylactic antifungal rinses. Despite its characteristic appearance, VX may be mistaken clinically for benign or more aggressive types of oral lesions. It is imperative for oral health care providers to have a thorough understanding of oral soft tissue lesions to provide optimal patient care. Dr. Desai is a resident, department of oral medicine, University of Pennsylvania School of Dental Medicine, Philadelphia, Pennsylvania. Acknowledgement: The authors thank Dr. Faizan Alawi (department of pathology, University of Pennsylvania School of Dental Medicine) for his assistance regarding the histopathology associated with this case. Esmeili T, Lozada-Nur F, Epstein J. Common benign oral soft tissue masses. Dent Clin North Am. 2005;49(1):223-40, x.
Stoopler ET, Alawi F. Clinicopathologic challenge: a solitary submucosal mass of the oral cavity. Int J Dermatol. 2008;47(4):329-31. Kumaraswamy KL, Vidhya M. Human papilloma virus and oral infections: an update. J Cancer Res Ther. 2011;7(2):120-7. Jaju PP, Suvarna PV, Desai RS. Squamous papilloma: case report and review of literature. Int J Oral Sci. 2010;2(4):222-5. Feller L, Khammissa RA, Wood NH, Marnewick JC, Meyerov R, Lemmer J. HPV-associated oral warts. SADJ. 2011;66(2):82-5. Stoopler ET, Balasubramaniam R. Images in clinical medicine. Human papillomavirus lesions of the oral cavity. N Engl J Med. 2011;365(17):e37. Alkan A, Bulut E, Gunhan O, Ozden B. Oral verrucous carcinoma: a study of 12 cases. Eur J Dent. 2010;4(2):202-7. Santoro A, Pannone G, Contaldo M, Sanguedolce F, Esposito V, Serpico R, et al. A troubling diagnosis of verrucous squamous cell carcinoma (“the bad kind” of keratosis) and the need of clinical and pathological correlations: a review of the literature with a case report. J Skin Cancer. 2011;2011:370605. Epub 2010 Oct 25. Shahrabi Farahani S, Treister NS, Khan Z, Woo SB. Oral verruciform xanthoma associated with chronic graft-versus-host disease: a report of five cases and a review of the literature. Head Neck Pathol. 2011;5(2):193-8. Epub 2011 Feb 9. Polonowita AD, Firth NA, Rich AM. Verruciform xanthoma and concomitant lichen planus of the oral mucosa. A report of three cases. Int J Oral Maxillofac Surg. 1999;28(1):62-6. Yu CH, Tsai TC, Wang JT, Liu BY, Wang YP, Sun A, et al. Oral verruciform xanthoma: a clinicopathologic study of 15 cases. J Formos Med Assoc. 2007;106(2):141-7. Platkajs MA, Scofield HH. Verruciform xanthoma of the oral mucosa. Report of seven cases and review of the literature. J Can Dent Assoc. 1981;47(5):309-12. Visintini E, Rizzardi C, Chiandussi S, Biasotto M, Melato M, Di Lenarda R. Verruciform xanthoma of the oral mucosa. Report of a case. Minerva Stomatol. 2006;55(11-12):639-45. Philipsen HP, Reichart PA, Takata T, Ogawa I. Verruciform xanthoma — biological profile of 282 oral lesions based on a literature survey with nine new cases from Japan. Oral Oncol. 2003;39(4):325-36. Miyamoto Y, Nagayama M, Hayashi Y. Verruciform xanthoma occurring within oral lichen planus. J Oral Pathol Med. 1996;25(4):188-91. Oliveira PT, Jaeger RG, Cabral LA, Carvalho YR, Costa AL, Jaeger MM. Verruciform xanthoma of the oral mucosa. Report of four cases and a review of the literature. Oral Oncol. 2001; 37(3):326-31.